*Animal Boogie: Sing and dance to this fun sing along and make jungle animal masks! *There's a Hole in the Bottom of the Sea: Sing along and decorate sea creatures with paper collage. *Secret Seahorse: Learn about sea creatures and create underwater fabric collage scenes inspired by the illustrations by Clare Beaton. 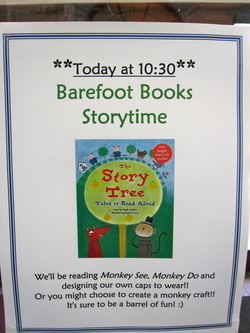 *Monkey See, Monkey Do: This Indian folktale from The Story Tree will be read, acted out, and then children will have the opportunity to design their own hats or make a monkey mask! *Port Side Pirates/Starlight Sailor: Create treasure maps, spyglasses, and paper boats! *Grandpa's Garden/What's This? : Design your own garden plot and plant seeds. *The Gigantic Turnip: This humorous classic tale lends itself to acting and decorating farm animal masks. *Lola's Fandango: Enjoy this beautiful story then create little dancers. *Bear at Home/Bear About Town: Create maps of our homes and our towns after reading these fun Bear books! *The Prince's Bedtime/The Real Princess: Decorate crowns and make wands! *Lin Yi's Lantern: Make paper lanterns! *My Daddy is a Pretzel/Yoga Pretzels: Join in yoga poses and breathing exercises! *Kids' Kitchen/Herb the Vegetarian Dragon: Create a simple cooking activity and learn about healthy foods!